It's Lovely! I'll Take It! : What? They're dead, so what's the problem? No. That is their alien ship and soon they will be returning home. "HOA fees & pest service included in rent." eeewwww. the flooring does look wonderful though! 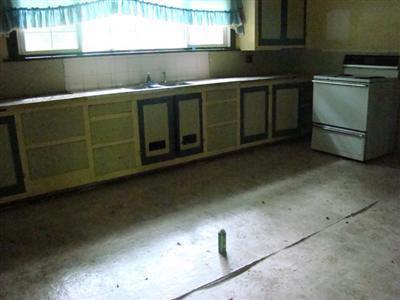 It looks like they just put down some sheets of butcher paper to cover the exposed and badly buckled floor boards. I live in NYC in a very old and very crappy apartment, but these pics make me feel better. Oh, the ROACH INFESTATION is over? Fabulous! SOLD. If they wouldn't have nailed their feet to the floor, they would be pushing up daisies. These are some dead cockroaches! The realty information said that the tax year was 1353. Uuuum....no wonder. But on the other hand, in 1353, this would have been a palace.